I have two daughters. One loves meatloaf and the other hates it. 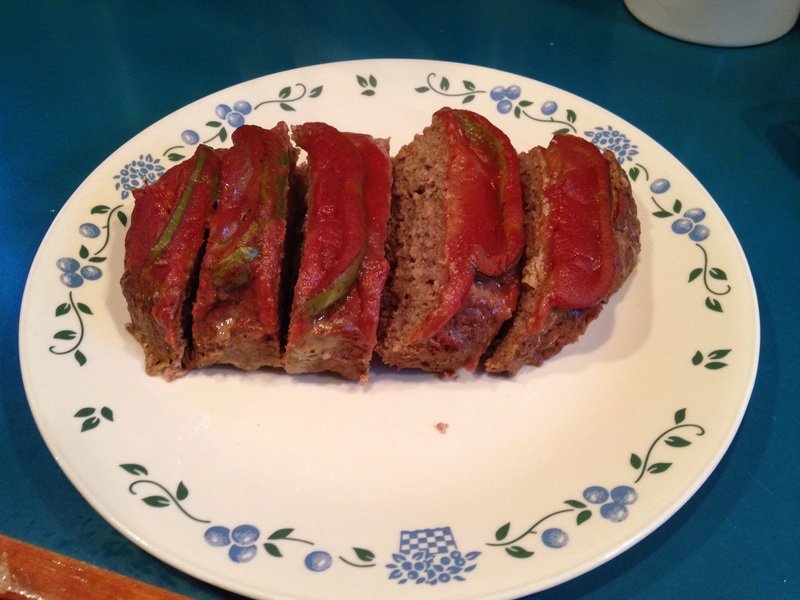 So on nights when the meatloaf-lover is home for supper and her sister isn’t, I like to whip it up for her, which on a work night takes a little planning ahead, since the most difficult part of this recipe is the 45 minutes – an hour it takes to bake. 1 – 2 lbs of ground beef or turkey (or a combination thereof) I tend to use grass-fed beef if I go that route, for less fat and better nutrition. 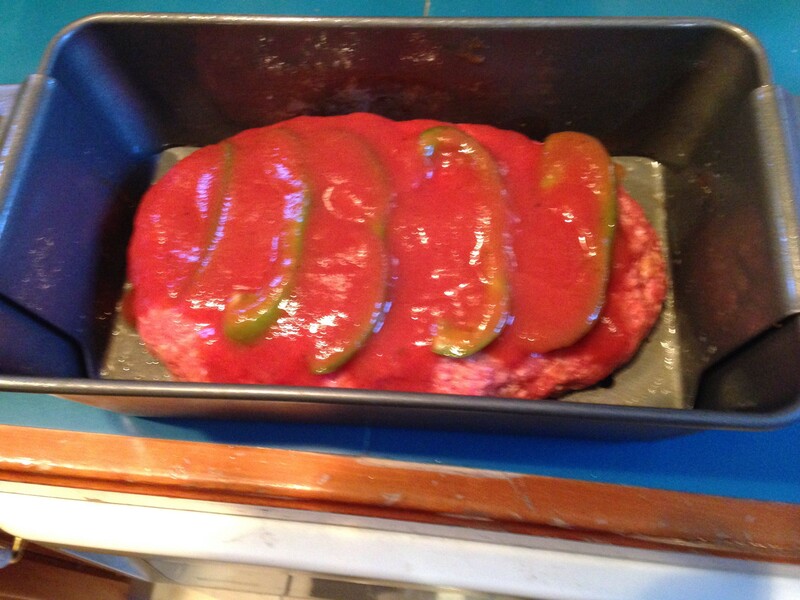 1/2 cup tomato sauce (I usually open a 15 oz can, seasoned or plain, your choice). Reserve another cup of the sauce for the top of the loaf. After mixing, form into an oblong loaf (sort of an exaggerated egg shape…longer and flatter is best for even cooking) and place into a bread pan, or a meatloaf pan, like the one I have here, with a little “rack” that lifts the finished loaf out when done. 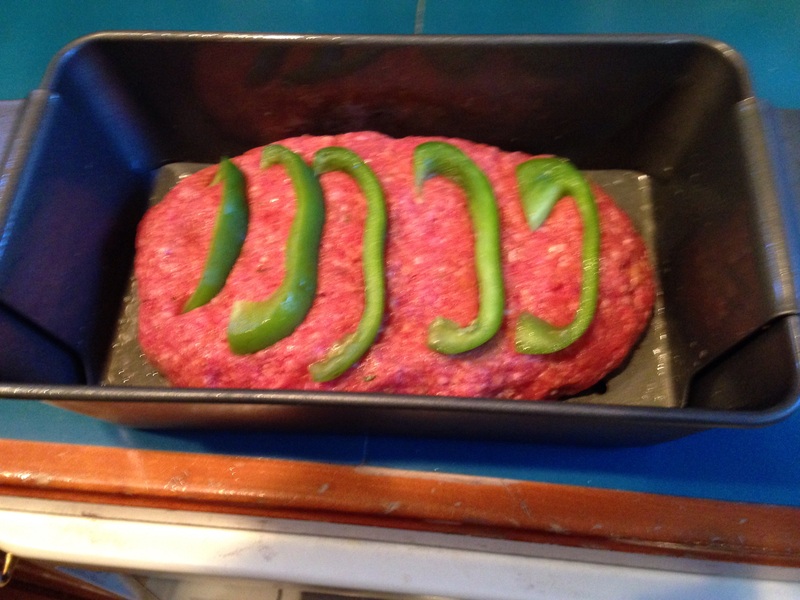 My mother always used green pepper slices for garnish along the top, so that’s what I like to do too. Pour the reserved tomato sauce over the top. This keeps the loaf nice and moist as it’s baking. Put it in the oven, and in about an hour, you have your main course! I often use that time to make the side dishes – usually peeling and boiling potatoes for mashed potatoes, and some fresh green beans or peas. It’s a great autumn or winter meal! Mom always put strips of bacon across the top. Two of the basic food groups. The third? Doughnuts, the gooeyer the better! With raisins. The “Green Dragon” farmer’s market in Ephrata (Lancaster County), PA has a vendor that sells, without a doubt, the very best apple fritters on earth.